Nashville is a guitar town and the perfect place for a gathering of amp, guitar and pedal builders. That’s exactly what happened this past weekend at the 2013 Nashville Amp & Gear Expo. All but five of the eleven hotel floors were full of amps, pedals, guitars, speakers, microphones, and just about anything else related to guitar. Attending a show like this is like living in the world’s best guitar store for a weekend. 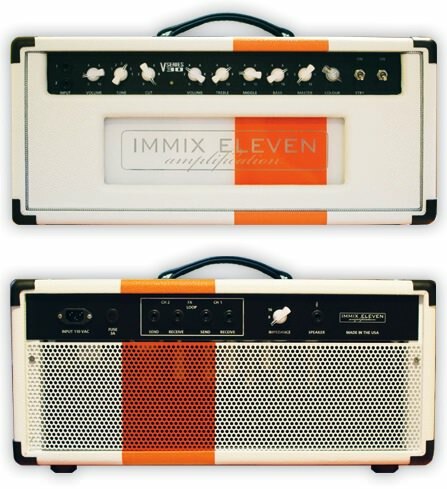 I first met the guys from Immix Eleven at the NY Amp Show a few months ago when I plugged into the VS-30s. It is very hard to create a standout product at these shows - the quality level is through the roof with that many successful boutique builders together in the same building. Yet, the sound of that amp stayed with me all these months, and I could not shake the feeling that there was something special about it. This weekend I had my own guitar (my SRV Strat with Zexcoil pickups), so I was ready to listen closely. It’s not a traditional sound for a SRV fanatic like me because it’s based on EL84 power tubes, not the 6V6 or 6L6 tubes that Fender is known for using. It’s spankier, with a high-end bite that I’m not used to, but I like it - a lot. The Wampler Pedals crew are some of my favorite people to hang out with at these shows. They call me Stevie to get on my nerves, and I talk about how great other company’s pedals are. It’s a great relationship. At one point on Saturday, the entire Wampler crew left the room to go take some pictures, leaving me in the room alone with the entire Wampler pedal lineup - plus a few that don’t officially exist yet. After calculating the consequences of packing all those pedals into my suitcase, I decided to try them instead of stealing them. Not everything is my cup of tea, but a few of them surprised me. 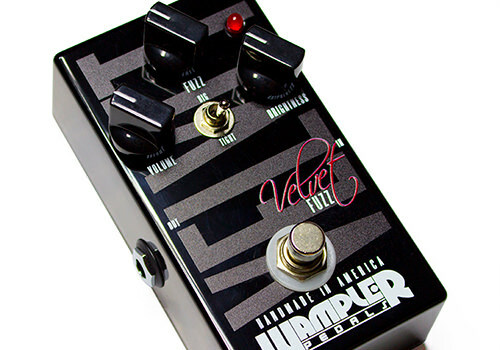 Velvet Fuzz - This is a great fuzz pedal for people who have never liked traditional fuzz tones. It’s more subtle, and more controlled than a fuzz-face style pedal. It is still very thick sounding, but way more usable in my opinion. 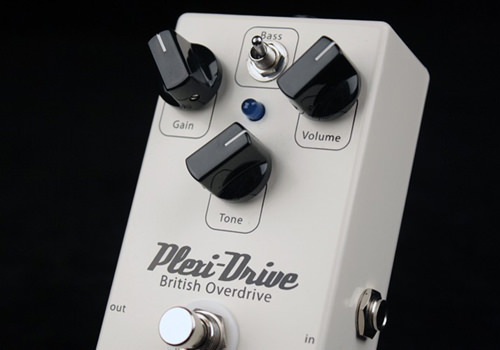 Plexi-Drive - This one surprised me - what a great, great sounding overdrive. It’s much lower-gain than most of Brian’s other dirt pedals, but with an unmistakable Marshall sound that works really well with other pedals pushing it. It’s really touch sensitive too, I was able to go from clean to gritty with just a slight change in attack. SLOStortion - This was a surprise as well. 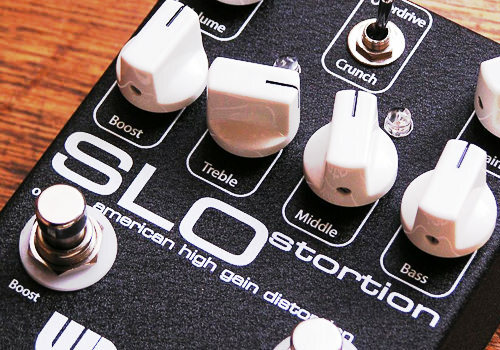 Not really a typical “blues” pedal, but the SLOStortion has tremendously thick distortion, very midrangey and ‘solid’ sounding. Can’t imagine what I’d use it on, but I really like it. The Yoke (currently a prototype) is a cool device that allows you to switch between several programmable pedal loops. Each loop can pass through one or more pedals. 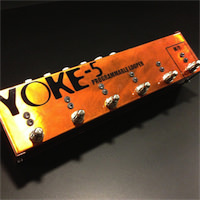 Unlike a midi switching system, the Yoke sits right on your pedalboard and connects directly to your pedals. You program the different preset switches to activate one or more pedal loops - allowing you to instantly activate the exact combination of pedals you want. Back in August at Summer NAMM, the Wampler Pedals booth was full of these handsome guitars made by a guy named Charles Whitfill. They played great, but my time with them was limited. At this show I played them a bit, then some more, and when I locked myself in the Wampler booth I played a Whitfill guitar for quite some time. 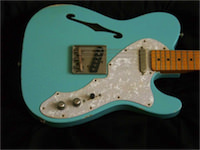 He specializes in Tele and Strat inspired guitars with a tasteful amount of relic touches. They are extremely playable, solidly built, and very, very attractive. Charles is a very cool dude and we talked about for a bit about what I’d like in a guitar…. hmmm. I’ve wrote about this amp in my Summer NAMM writeup, and my impressions were even better this time around. This time I was hearing it with my own axe and it was spectacular. The 4 Aces has a lot of the same elements, but the Blackjack feels more muscular. 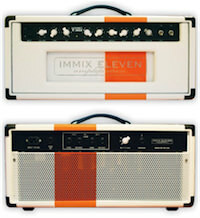 The Fuch’s “sound” is inspired by the tone of Dumble amps. For the SRV Nerds this is relevant because although Stevie is mostly known for his Vibroverbs, the tone on the “Texas Flood” album sounds more like a Dumble than a Fender. I’ve never owned a vibe pedal before, but a friend at the show was really excited about this pedal so I checked it out. The guys at the booth were very friendly and gave me a good demo of what it could do. Despite my lack of experience with these pedals, I thought it sounded fantastic. They had a great show price on the pedal so now I have one on my board. 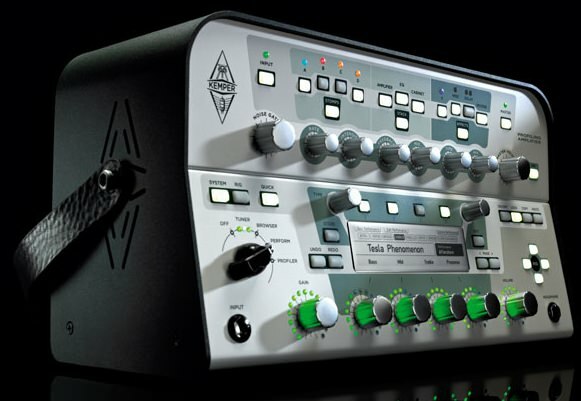 The Kemper Profiler is an interesting machine. It’s not really an amp modeler - those mostly use a process called convolution to capture the sound of an amp - but the Kemper does something different. At a previous show someone told me it was “German Black Magic”. :-) Whatever it is, it’s pretty amazing. Not all profiles are created equal though. 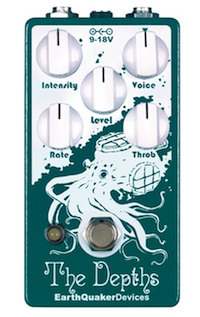 The Kemper is like a mirror - it reflects whatever it “hears”. It profiles the amp AND microphones. Poor mic placement will result in an unimpressive profile. But I played a Bassman profile that was pretty amazing. The real test would be to record with it, that’s where most digital gear falls apart for me. Pretty much every video I’ve made in the last four years has been recorded with a Samamp Amplifier. In 2009 I bought a VAC-23, in 2011 I replaced it with a VAC 40 Series II, which is still my primary amp. It is an amazing amp and I love it. Sam prefers to focus on one model of amp at a time - life as a one-man company is full of tough choices - so he recently discontinued the VAC 40 to focus on designing a reverb circuit for the VAC 23. Personally I’m not a big reverb user, and I’m totally in love with my original VAC 40 prototype, but I think the 23-verb is going to make a lot of players happy. There’s not much to say about Jack Pearson except that I feel hypnotized watching him play. He suffered a broken vertebra this summer, and has only recently started playing again. He couldn’t stand for very long so he played the show sitting down, but his playing was as spectacular as ever. Seeing him play is an experience that is hard to put into words. I only wish there were more recordings of him available to buy. That pretty much sums up my experience of the show, but I’ll leave you with a few thoughts on the boutique guitar gear industry. All I know is this. 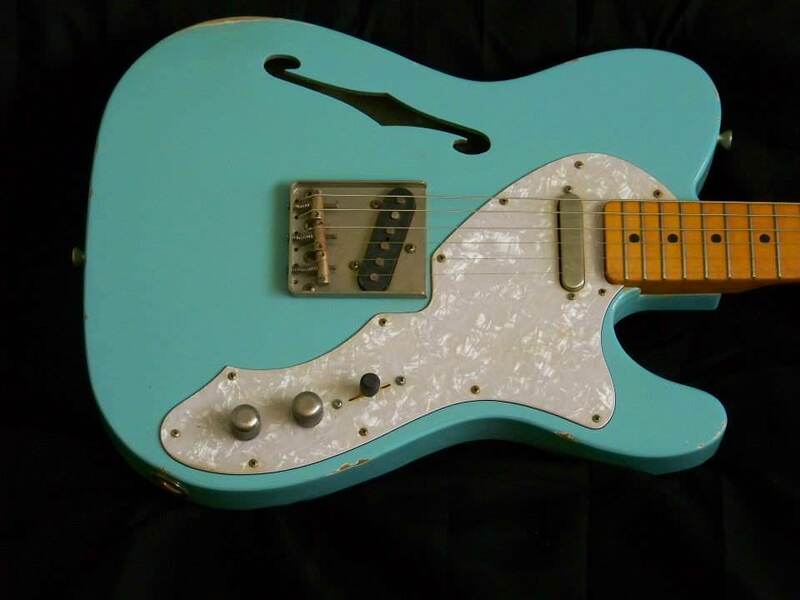 Very few people making boutique gear are getting rich doing it. A few builders sell enough to have employees. Others sell only enough pieces to keep making more. I’ve heard builders compliment each other’s products, both in public and in private. I’ve seen them talking, joking, and even playing each other’s gear. They compete for the same dollars, but I think they also know that nobody appreciates the struggle they face more than their competitors - not even the customers. So the next time you see a $2000 amp, a $250 pedal, or a $3000 guitar - even if you can’t afford it - remember that it’s made by a person, not a machine, and that person probably could have picked an easier way to make a living.